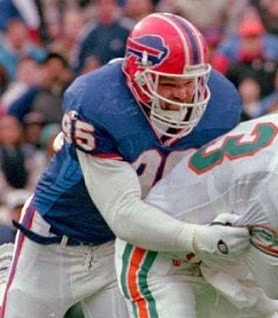 Paup was chosen by the Green Bay Packers in the sixth round of the 1990 NFL draft and saw little action in his rookie season. In ’91, he was used as a situational player and had 7.5 sacks, all of which came in the first four games. His intelligence and intuition made up for a lack of speed and he moved into the lineup in the role of a hybrid linebacker/defensive end. Paup had 11 sacks and 74 tackles in 1993 and received All-NFC and Pro Bowl recognition in ’94, following a year in which he accumulated 7.5 sacks and three interceptions. He signed with the Bills as a free agent in the offseason where he proved to be an effective complement to DE Bruce Smith. Bills went 10-6 to finish first in the AFC East while leading the NFL in sacks (49). Won AFC Wild Card playoff over Miami Dolphins (37-22). Lost AFC Divisional playoff to Pittsburgh Steelers (40-21). Paup was hobbled by injuries in 1996 and held to just six sacks, but was still a second-team All-AFC selection by UPI and chosen to the Pro Bowl. He was chosen again in ’97 after registering 9 sacks, although the team’s switch to a 4-3 defense limited his effectiveness and he moved on as a free agent to the Jacksonville Jaguars in 1998. Following two disappointing years in which he had just 7.5 sacks, he finished up with the Vikings in 2000. Overall, Paup accumulated 75 sacks in 148 games and was named to the Pro Bowl on four occasions.